It's been almost two months since my last post due to a combination of being too busy and not really wanting to blog about politics. It seems that everything is being overly-politicized right now. A simple rally to protest Iranian President Mahmoud Ahmadinejad at the United Nations has turned into a Democrat vs. Republican battle royal. According to the JTA, Hillary Clinton was confirmed to speak at the rally back in August. However, when Republican VP nominee Sarah Palin agreed to address the rally, Clinton announced she would withdraw because the rally had become "a partisan political event." Barack Obama wasn't even invited to speak. Bottom line is that Palin has been disinvited and Clinton has backed out. Fortunately no one will oppose Elie Weisel's legitimacy to speak at the rally! And isn't it possible for a Jewish person to just wear a kippah (yarmulke) without making a political statement? The kippah color, size, material, and position on ones head is already making a religious statement, so why the need to endorse a candidate with a religious head covering? Even this has spun out of control. The Gore-Lieberman kippahs were popular during the 2000 campaign and since then it's been common to see the candidates names on suede kippahs. 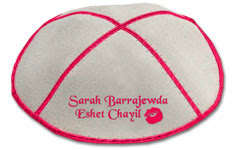 However, one company (VanityKippah.com) is now selling a Sarah Palin kippah that says "Sarah Barajewda: Eishet Chayil." They also sell the McCippah, the Obamica, and one for Michelle Obama fans that reads "Michelle is my Rebbetzin." Oy, I can't wait for this campaign to be over! (Øbowmao kissing the islamic tuchis is NOT).